Get the benefit of using a travel agent and the affordability of using your miles. Need help choosing a travel destination and have unused credit card miles? 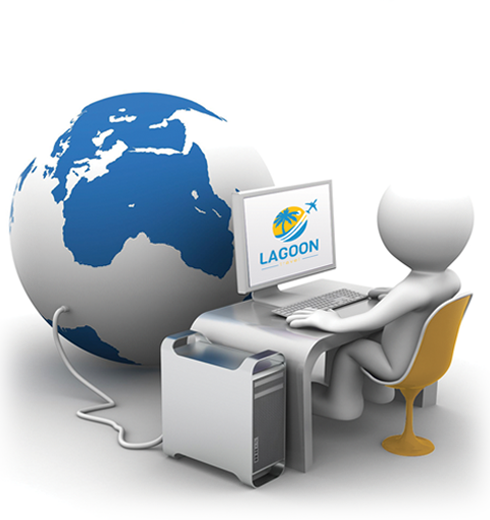 Lagoon Travel Agency provides expert travel advice with the flexibility of using your miles. Experience travel booking like never before, and discover how you can access first class or visit places that seemed financially out-of-reach. Save money and eliminate stress by booking with us. As a full service travel agency, our customers receive personalized service from experienced travel agents — with the choice of using miles or cash. Our awards program gives you the ability to maximize your miles the smart way. Get first-hand knowledge of worldwide travel destinations to choose the perfect trip, and we’ll book it for you using your miles. Avoid the hassle of cashing in miles and researching destinations while saving time and money! Live lavishly without the expensive bill. Make your dream a reality by getting expert advice on getting the most out of your miles. For a nominal fee, we use the miles you've already earned. We’ll give you expert advice and book the trip you’ve been dreaming about using your miles. You get the best prices at the best places without having to spend the time or effort looking for deals. Save money and live large! You can earn miles by taking advantage of sign-up bonuses with major credit cards or by using your frequent flyer mileage account every time you travel or stay at a hotel. Combining miles varies among different programs and companies. Is it free to use my miles? While it is free to use your miles, we charge a booking fee to book your trip with your miles. Can you help me book a hotel with my miles? Yes, we specialize in hotel bookings as well. What happens if I have to cancel my award booking? Should you have to cancel your trip for any reason we will do our best to help you get back the miles and taxes paid, at the same time our Award Travel Fee is nonrefundable. Can you trade my miles for something else? Unfortunately, miles cannot be traded for any other offers. Can you buy or sell my miles? No, we don't buy, sell, or trade your miles.Rest assured that your miles won’t be used inappropriately, which could jeopardize your ability to earn more. We help you make the most of what you have, and it’s all part of the service you should expect from an experienced travel agent.